On 17 March, ATLAS presented their latest Higgs physics results at an LHC seminar at CERN from data collected during the LHC's first run. The updated results include searches for the Higgs boson in association with top quarks, measurements of the spin and parity, and improved and combined coupling measurements, all showing good compatibility with Standard Model predictions. These results are also being presented at the 50th Rencontres de Moriond ElectroWeak conference, in La Thuile, Italy, this week. The discovery of the Higgs Boson in 2012 by the ATLAS and CMS experiments at a mass of approximately 125 GeV marked a milestone in the history of particle physics. It confirmed a long-standing prediction of the Standard Model, the theory that underlines our present understanding of elementary particles and the way they interact. 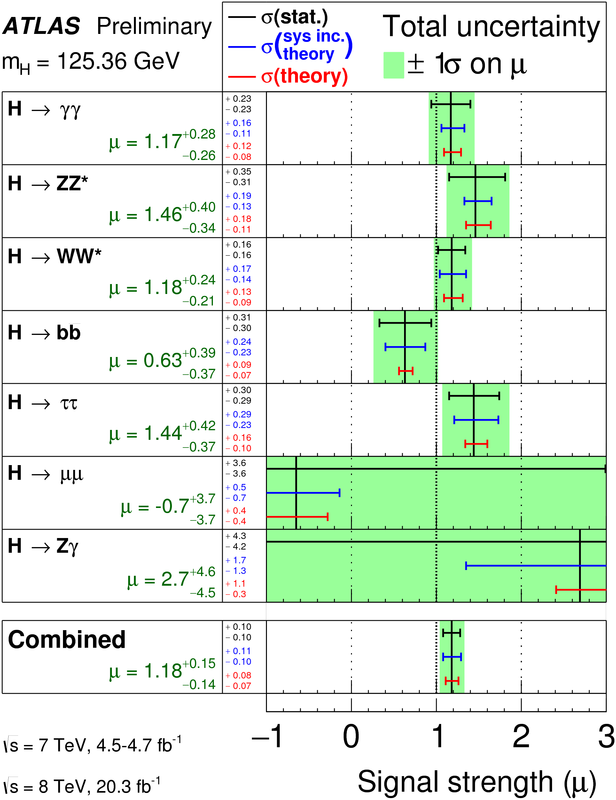 Both ATLAS and CMS have published a measured value of the mass of the Higgs boson mH using the high precision H->γγ and H->ZZ*->llll channels, with accuracies limited by the statistical uncertainty. The two collaborations have joined forces to combine these measurements and today presented a new combined value of mH = 125.09 ± 0.24 (0.21 stat. ± 0.11 syst.) GeV, the most precise measured value to date, with an uncertainty reduced as low as 2 parts in a thousand (0.2%). Once the mass of the Higgs boson is known, the Standard Model predicts precisely the probability (cross-section, σ) for each of the different ways the Higgs boson can be produced from the collision of protons inside ATLAS, the most probable being the fusion of two gluons. The Standard Model also predicts each of the different ways the Higgs Boson can decay; for example via two Z bosons into two pairs of leptons (electron (e), muon (μ) or tau (τ) particles). ATLAS physicists have been working hard to make precision measurements of the properties of the Higgs boson, such as its production and decay rates, and also its spin, to compare to the predictions of the Standard Model. The comparison can tell us whether the observed Higgs Boson is fully responsible for electroweak symmetry breaking, the phenomena which invoked its prediction, or whether new unknown particles or phenomena play a role in this process. Studies of the production and decay properties of the Higgs boson were presented where the Higgs boson decays into vector bosons, (γγ, ZZ, WW, Zγ) and into fermions (ττ, bb, μμ). The signal strength μ = σ/σSM allows one to compare the measured cross-sections (σ) of each decay channel, to that predicted by the Standard Model, (σSM). All results, shown in Figure 1, were found to be compatible with μ=1, corresponding to Standard Model predictions. The new combination of all production and decay channels gives the most precise value from ATLAS to date, of μ = 1.18 +0.15 – 0.14. Latest results were presented on the search for the production of the Higgs boson in association with two top-quarks (link to both ttH papers), a very rare process, and the only channel that allows one to directly probe the mysteriously large top-Higgs Yukawa coupling. A number of different decay modes of the Higgs boson were analysed, including decays into fermions (bb, ττ), and into bosons (WW, ZZ) the latter decay mode being measured for the first time by ATLAS in association with top quarks. Gathering all the decay channels together the data showed a small an excess of events over background with a strength μ(ttH) = 1.80 +0.84 -0.74, where μ =1 corresponds to Standard Model predictions. This gives a significance of 2.4 standard deviations with respect to a no-ttH hypothesis. To reach enough significance for the observation of the Higgs boson in this channel ATLAS will require more data collected in Run 2. Improved studies of the spin and parity of the Higgs boson were presented, confirming that the Standard Model hypothesis, corresponding to a spin-0 particle with positive parity, is favoured at more than 99% confidence level. The LHC will restart in just a few weeks for Run 2 with a proton-proton collision energy of 13 TeV, more than 60% higher than that of Run 1. In these conditions, the production rate of the Standard Model Higgs boson will increase by more than a factor of 2, and by almost a factor of 4 in the case of the ttH process described above. With an upgraded detector and updated software, ATLAS is ready to exploit the full potential of the LHC's second run to learn more about the Higgs boson, and to look beyond for new phenomena.